Gareth got some interesting homework this week. I was very interested in reading what he thought about me. Particularly my hobbies. Not sure when I last went fishing and I love that he thinks I exercise every day. More like once a month at the moment! I'm so looking forward to this weekend when I plan on dusting down my bike and cycling to the local jetty for a spot of fishing and then maybe a little jog before coming home to relax in front of Masterchef! My sister had a phone call with me a couple of weeks ago. She was talking about a book, how great it was, had I read it? In my head I was imagining a self-help-think-positive-change-your-life kind of a book. When she told me a couple of days later that a surprise was on its way to me I guessed that maybe I was going to have a copy of this book land on my doorstep soon. Sometimes I'm open to new ideas. Sometimes life is busy, I am tired and quite frankly although I'm sure there are lessons to be learned I'm just not in the mood to learn them. This is how I felt as I came home to a cardboard parcel on my doorstep. The house was a mess, I had a list of jobs and errands as long as my arm, I really didn't have any extra time left over for the luxury of reading. The biggest mistake I could have made was opening up the parcel. The book fell out. 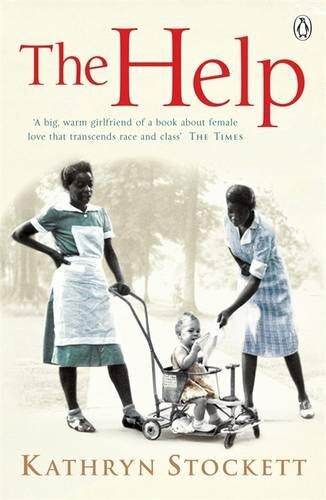 It was called "The Help"
I haven't been able to stop reading all week. I've read it at home while jobs have sat un-done, washing has piled unsorted, I've brought it to work and read in my coffee break, I read it waiting in the garage forecourt for my turn to fill up the car with petrol. I've stayed up later in the evening than is sensible and stirred dinner on the stove with one hand while reading furiously the book held away from splashes in the other. I know it is a fictional novel. But what shocks me is that it is based on fact. It is set in the 1960's. Black women leaving their kids alone at home to look after white children for less than minimum wage at a time that was only a few years before Byron and myself were born. It read like something from generations and generations ago. It is hard to think that it was based on children that are now grown and only in their 40's and 50's. When I look around at the multi cultural life that my kids are living here in Australia I realise how different a life it is from the one described in this book. The life I live as a mother is so different too from the women portrayed in this book who are so desperate to be accepted into the country club lifestyle of their peers. I cried and clenched my fingers tight as I read this moving story of women who just wanted to be treated as equal. Maybe we don't yet live in a world where this is a reality but the fact that we can do something as simple as shop in the same stores and use the same public bathroom means we have come a long way. If you have time on your hands I recommend you read this book. If you live nearby me and want to borrow my copy just ask, you may need to air out the tear soaked pages first though. This week has been fun with Gareth and Rhiannons school holding their Athletics carnival. The day started grey and windy but the sun came out for the morning and the heavy rain and wind storm held off till the evening. Along with some fun activities too! I enjoyed being there this year and was so thankful that it fell on a day I wasn't working. The school activity schedule fairies have been on my side so much this year. This week many people will be hosting "Australia's Biggest Morning Tea" events to raise money for Cancer research and patient support. Byron's work are hosting theirs tomorrow and my work will host theirs on Thursday. My contribution to the goodies are some really simple and healthy carrot cake muffins. Well healthy in that they are made with olive oil, wholemeal flour and brown sugar. Not so healthy when you see what went into the cream cheese frosting and the marzipan carrots! But then life is all about balance isn't it. One muffin in my right hand, one muffin in my left....! Rhiannon and her friend recently sent a home movie in to the children's tv channel Nickelodeon. It was to audition for a wacky show called Camp Orange. You had to do zany things and show that you were game for a laugh. Unfortunately they didn't qualify for the program but the tv show sent them a message to keep watching as many of the audition clips will be shown over the coming weeks. Today Rhiannon and Gareth nearly screamed the house down when they saw Rhiannon and her friend appear on screen! A one second image from their video was shown as part of the build up to the audition clips being shown early next month. They managed to record the ad and we got a grainy movie clip on my phone. They are so excited. Not quite 15 minutes of fame, more like one second, but very exciting for these wanna-be wild kids! 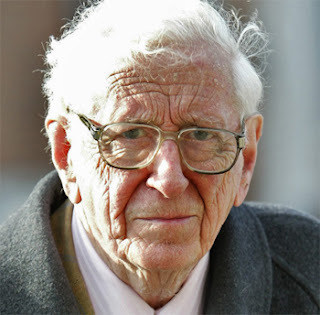 Today I received the sad news of the death of Dr Garret FitzGerald. He was the former Taoiseach of Ireland. The equivalent of the President or Prime Minister for those who are not Irish. He was often referred to as "Garret the Good" and was known as one of the few genuinely honest men of Irish politics. The reason that his death has left me so sad is that I had the honour of working for him in his family home as a newly qualified nurse. I shouldn't really say I worked for him because in the months that I spent with him in his home I was treated as part of their extended family. The first day I turned up to work in my official white dress, I was then politely told there was no need for that and it would be better if I just wore normal clothes and looked like I was visiting. The next day my lunch box was spotted and I was told "There'll be no more of that sandwich nonsense" I was to eat whatever they were eating. Over the following months I became their regular night nurse and turned up each evening and participated in whatever the family were doing. Dr FitzGerald had a love of history and taught me a respect for tradition and storytelling. I remember one evening setting the table for an important visitor and he told me the history of every piece of crockery and silverware as we lay them out together. I held an item and studied it, a mahogany and silver shallow coaster. He was speechless that I had no clue what it was and he explained that it was to sit the wine bottle in during a meal. The next day I went for a wedding dress fitting and passed a small antique shop in the backstreet's of Dublin. There in the window was a pair of similar coasters. I stopped and looked closely through the glass then pointed them out to my mum. "Do you have any idea what they are?" She didn't and I delighted in telling her something I knew and she didn't! When I returned to the FitzGerald house that evening I told my story with glee and Dr FitzGerald's eyes twinkled as he nodded and praised me like a teacher would a student. He questioned where exactly the antique shop was and without me knowing he sent someone looking for it and bought the two coasters for me as a wedding present. They also gave me money with which I bought a set of silver candlesticks. I promised him that when I laid the table for special occasions I would tell whoever was setting the table with me the story behind my "FitzGerald candlesticks" and silver wine coasters. And so Dr FitzGerald, tonight, here in Australia I remember you. I set the table for dinner with my family and even though it was mid week we got out the FitzGerald candlesticks and ate our dinner by candlelight as I told my three kids the wonderful memories I have of those months spent with you and your family. A respect for my elders, a respect for fine things and for tradition and story telling. I hope you know how much you were loved. I hope you know the impact you had on the people of Ireland. I hope you know you are remembered. One who just could not let me be alone during my modelling debut. A friend who emailed and persuaded other true friends to join in on the afternoon of pure hilarity. A friend who brought her camera along so that the moment could be captured for all time. Monica, I cannot wait for an opportunity to repay you...! ...and the least said about the purple stripes the better. It's the one that reduced Monica to tears! Don't bother reading this post unless you want to laugh at me. This weekend I was involved in something a bit embarrassing. I was asked to help out with a fundraiser in our kids school/church community. How could I say no? Even when what I was asked to do came with a high mortification factor? In some ways being asked was a compliment. 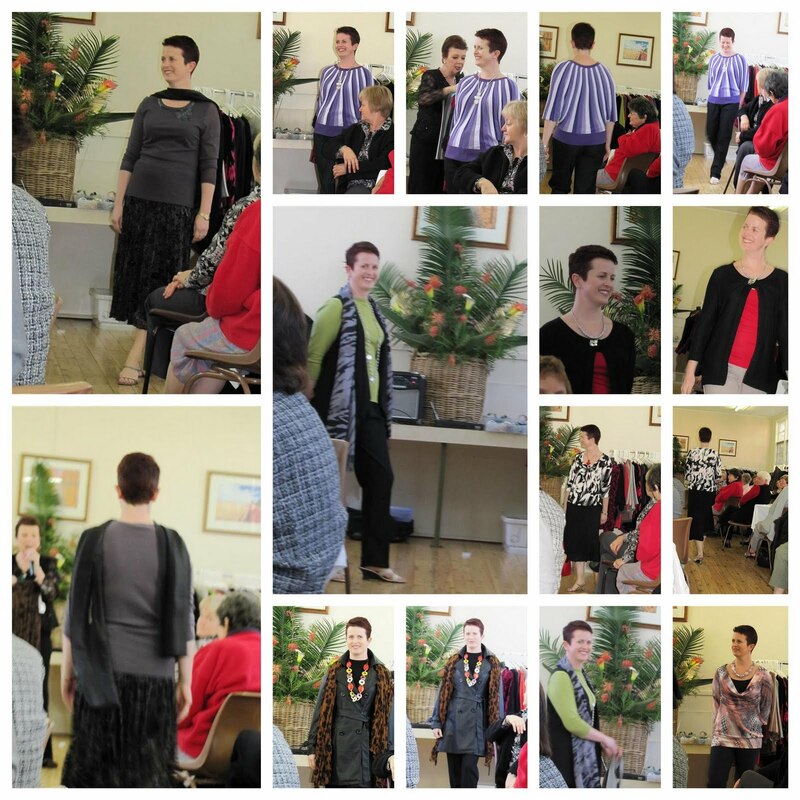 I was asked to be a model in a Fashion Show. The downside? 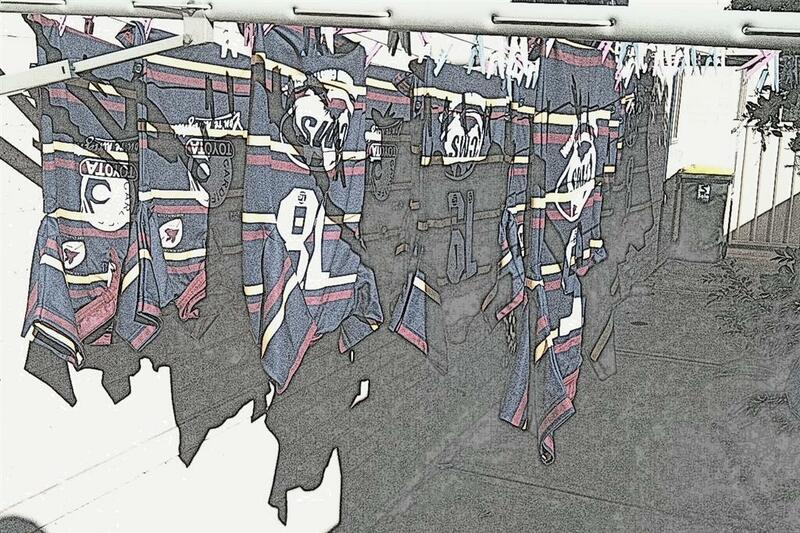 The clothes were aimed at... a somewhat older age group. Like add on a decade, or two. And how I was asked? Well I wasn't even first choice, someone else dropped out. In fact it was worded something like this.... "Oh please, we are desperate...."
I think I would have got away with it if my lovely friend Monica hadn't been in earshot as I was asked. Because if Monica hadn't sent around a global email to all our friends encouraging them to come laugh at me support the fundraiser then no-one would even have had to know. No-one would have taken photos. Which I have copies of. But I'm not sure I want to share them. I mean who wants to see me dressed up in clothing better suited to my mother? Who would want to laugh at me wearing the purple stripy bat wing sweater that made Monica literally cry with laughter? Most bright and sunny Saturday mornings I like to get the washing on the line drying in the warm Australian sun. Today after we returned from rugby my washing machine was going full throttle and the line was groaning with the weight of the wet clothes. Not a single bit of normal washing was to be seen. 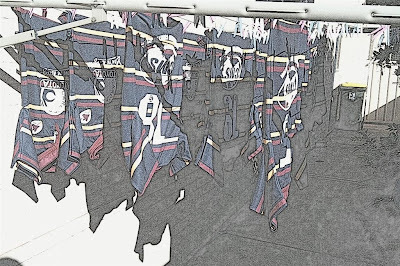 Today it was my turn to take home the entire teams muddy rugby kit! Somewhere right now a nurse is helping a woman become a mother, holding the hand of a dying man, inserting an IV into a child or listening to an Alzheimer’s patient tell a story they've already heard a hundred times. Somewhere right now, a nurse is getting yelled at for being late with meds, holding their bladder because they have been so busy they can't pee. In my hospital right now one of my colleagues has worked over 14 hours straight because someone rang in sick. She won't get home to her family for another hour. We started together at 7.15 am this morning and she volunteered to let me get home to my kids because they are younger while she worked a double shift. Today is international nurses day. Please think of the nurses caring for people in your town tonight. They don't do it for the money. If you get a chance to tell them they are appreciated please do it. Think of my work mate who is probably dropping on her feet with tiredness by now as she comes near the end of her day. It's not an easy job but the reward is in the people we get to care for and work with. Happy International Nurses Day to you all! This time of the year in Australia the heat has gone from the sun. It is still warm(ish) but the air is fresher and we no longer have to slap on sunscreen before getting dressed every morning. The perfect weather for going out walking. Less chance of getting caught out in blazing heat and having to carry huge volumes of water for hydration. And so on a recent sunny day we decided to do a walk in a rugged rainforest called Glenrock Lagoon. It is a two kilometre steep downward walk through the rainforest, some of it on steps and some over rough rocks and tree roots. It ends as you walk through the thinning tree cover into the sunshine and find your feet walking on sandy ground and finally a magnificent lagoon on an isolated golden beach. We had two of the girls friends join us because their Mum was working. We knew that the weather forecast mentioned showers and so we all had waterproof jackets and sensible footwear. When we got to the beach the sky was darkening over and there was a brisk wind. The kids took off their shoes and ran around catching tiny crabs, climbing the cliff and throwing stones into the lagoon. Maybe this is where I should sign off and leave you with this great impression of Australian Autumn. Because this is when the heavens opened. The rain came down like someone had turned on a giant shower. It rained so hard and fast we couldn't get our rain jackets out of our bags and on ourselves before the rain had soaked us! We then started the two kilometre walk back uphill to the car. This time the rocks were incredibly slippery underfoot. The rainforest looked so different as the foliage came to life in a shiny rainbow of greens and oranges. As I tried to take a photo here and there without the camera getting soaking I was slipping further and further behind the kids who kept a good pace so I put the camera back inside the safety of my jacket and quickened my pace to join them. They were great. While Byron and myself felt and looked like drowned rats the kids saw the adventure in it all. They didn't complain (much!) and were still grinning when we reached the car park. Ours was the only car left there and we jumped in and drove home with the heat on full blast, windows fogging up and promises of Hot Chocolate and marshmallows when we got home! I had a great time this Mothers Day. I had a lazy morning with endless offers of cups of tea, breakfast from the local bakery and very excited kids presenting me with some special gifts and cards. After lunch we went out for a walk along the beaches in Newcastle. Normally I take all the photos and don't often get in the frame but today the kids and Byron took over the camera and I appeared in many more than usual. I had to have words with Rhiannon for zooming right in on my face, what happened to arty fuzzy shots where the wrinkles are blurred out! We got fish and chips and ate ice-cream as the sun dipped lower in the sky. The colours of the clouds were amazing and the kids had a real thrill being on the sand watching darkness descend over the city. I don't think we have ever stayed out on the beach late enough for it to go dark before. It was like we didn't want the day to end! Happy Mothers day to all the Mums out there. Whether you are the sleep deprived Mum of very little ones, the frazzled Mum of a teenager or a Mum like my own in Ireland who's child has flown away to distant lands, I wish you a lovely day. 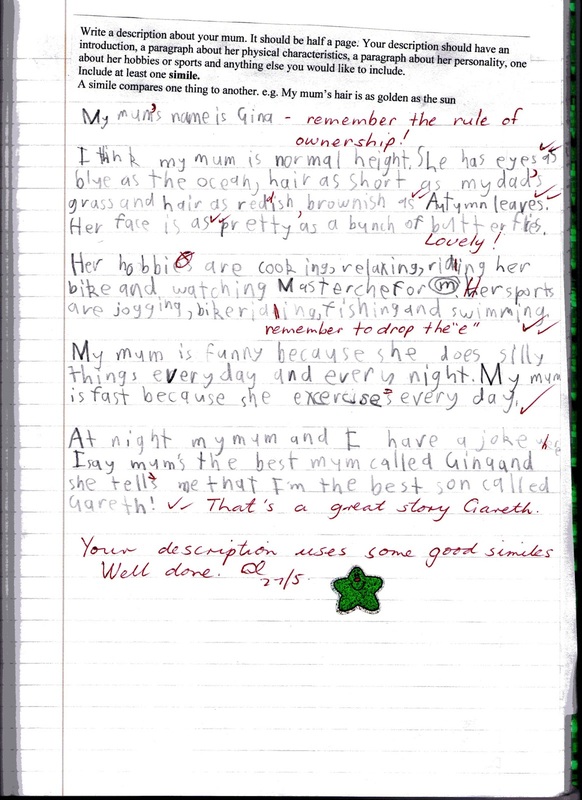 And for those of you who live in a country that does not officially celebrate Mothers day today then I would like to offer you the chance to sit down, have a cuppa, let the kids run wild and tell anyone who complains that you are celebrating with Gina! Can I just say a big Thank You to everyone for your wonderful comments, emails, text messages, and phone-calls since I published Sunday's post about finding my rings. I am quite private in my beliefs and I don't normally write posts that are overly religious. In this day and age with so many people with different beliefs and viewpoints I love to share who I am but not to preach or push people away who have different beliefs to me. I very nearly didn't publish Sundays story. I am so glad now that I did. I have renewed contact from friends that I had lost touch with. I have had people share their memories and stories with me about their childhood or about their own experiences in losing (and luckily finding) their own rings. Blogging started for me as a simple journal of our families day to day life but it has grown into a wonderful way to reach out and connect to so many great friends. You bring sunshine to my day. As a child growing up the first of May was always very special because it is the feast day of Our Lady. I was raised a Catholic and had a beautiful Grandmother that taught me so many things, how to pray the Rosary on my little set of beads I got for my Communion, how to crochet, how to write a proper letter. When she came to stay she would share my bedroom. There were two single beds side by side. She encouraged me to bounce on mine while she sat in hers opposite me and laughed. She sang old songs to me and taught me old fashioned poems about toys turning rusty waiting for the return of their child owner to play with them. All nostalgic things and many of them that have died out over the years. My kids know the words to lots of current songs on their iPods but how many poems? They send Thank You emails instead of writing by hand. Today as I hung washing on the line I thought back to how I spent the 1st of May as a child. We had a little statue of Mary and we would dust it down and get one of Granny's crocheted circles and set up a "May Altar" We would get a tiny vase and put some flowers in it and keep those flowers changed and freshened up over the month of May. Remembering these things made me feel nostalgic and so I went inside and started to tell my kids all these stories and memories. They wanted to make a "May Altar" of their own so I got out the one piece of my Granny's crochet that I own and a tiny antique Waterford crystal vase that was given to me on my wedding day. All that was missing was something to represent Mary. I thought about a small tea-light holder I use at Christmas. It has three glass panels with an image of the Holy family on it. It was the only thing I could think of so I went into the garage and pulled down the Christmas decorations box from a high shelf. What I found inside reduced me to tears. I need to side track to tell you something else so you will understand the end to my story. I have not been able to find my engagement ring for quite a while. Or my eternity ring. Or the diamond sapphire ring Byron bought me when we had Sian. I have torn my house apart and kept this awful secret from Byron till I felt sick. I take my rings off to go work as a nurse. I usually leave them in a particular place but they weren't there when I went to find them many weeks ago. I worried that I had put them somewhere foolish, that they were lost or thrown away or stolen. I have cried and torn cupboards out onto the floor desperately looking for them with no success. I finally told Byron a few weeks ago. He was as upset as me but had no clue where to find them either. When I reached my hand into the box of Christmas decorations I pulled out the tea-light holder. There inside it hidden under the used tea-light were my three rings. I can only assume that one morning in January I saw my rings on my hand as I was late rushing out the door to work, stopped and looked for somewhere to put them that they wouldn't fall or get lost and decided to drop them into the little holder till I got home. How I didn't go back for them I don't know. Or why didn't I see them as I packed the Christmas decorations away? All I know is that if I hadn't stopped today to remember my past, if I hadn't honoured the feast day of Our Lady, if I hadn't tried to keep an old tradition alive then I would not have found my rings until mid December when we decorated the house again. After I finished crying I went to find Byron and I cried again as I showed him the rings, I slipped them back on my fingers, placed the tea-light holder on Granny's crochet next to the vase of wild flowers and said a very genuine prayer of thanks. Thank you Mary for watching over me as a little child. Thank you for letting me have my rings back now instead of December. I make you the same promise now as I made as a child. I will try to keep your altar in place and with fresh flowers over this month of May.